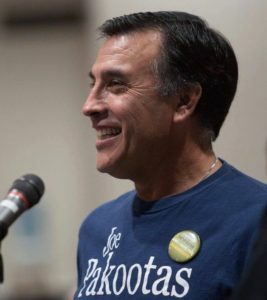 Joe Pakootas is the CEO of the Spokane Tribe of Indians, and ran for Congress in 2014 and 2016 to represent the 5th Congressional District (Spokane County and nine other counties in Eastern Washington). Joe grew up on the Colville Indian Reservation, was raised in Inchelium and has lived in Eastern Washington all his life. As a young child, Joe and his siblings were taken away from their parents and placed in foster care, where he committed to building a different life for himself. After graduating from high school, Joe took a job with the Laborers Union to support his family. Eventually, he was elected and served sixteen years as a Council member of his Tribe, five of those years as Chair. After receiving his MBA from the University of Washington School of Business, Joe turned to the uphill battle that hit close to home. Prior to his tenure as CEO, the Colville Confederated Tribes were suffering financial losses, with more than a dozen of their businesses at risk of failure. Joe was appointed CEO, where he focused on developing sustainable business enterprises and turning around 13 failing businesses to usher in a $10 million economic turnaround for his tribe. As a result of his hard work, his alma mater awarded him the Bradford Award, an award given annually to the top minority businessman in Washington. While CEO of the Colville Confederated Tribes, Joe implemented sustainable forest management practices, which was a first for any Native American Tribe in the country, now considered standard practice in forestry. Additionally, in 2006, Joe filed a lawsuit against Teck Cominco, a Canadian mining company that had been polluting the Columbia River and Lake Roosevelt for more than a century. The lawsuit was successful, and a federal judge forced Teck Cominco to clean up Lake Roosevelt and the Columbia watershed. For his entire life, Joe Pakootas has been committed to community building, economic growth, and environmental protection. From raising four children to serving as the CEO of a multimillion dollar corporation, to running for Congress, Joe’s background gives him the kind of real-world experience that we need in the vice chair of Washington State Democratic Party.